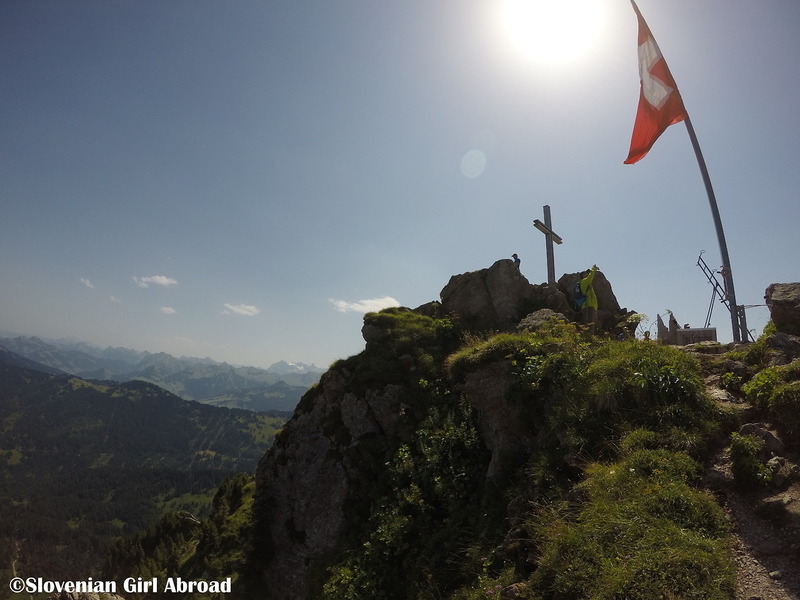 1st August is Swiss National Day – the public holiday celebrating the foundation of Swiss Confederation. On that particular day in 1291 the representatives of three original cantons Uri, Schwyz and Unterwalden (today split into Obwalden and Nidwalden) formed an alliance. This action is now regarded as the founding of Switzerland and is annually celebrated all across Switzerland with different events and fireworks. 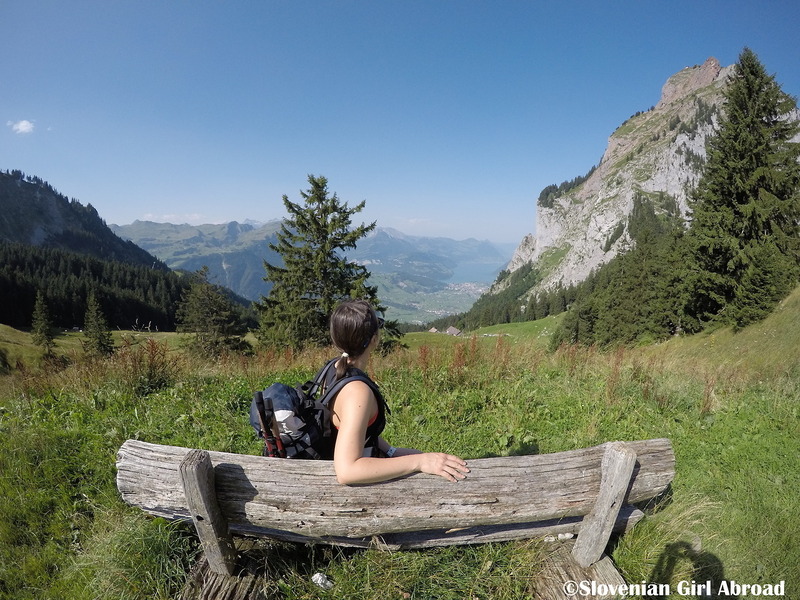 My husband and I spent this year’s the Swiss National Day in a very Swiss way: we went hiking. 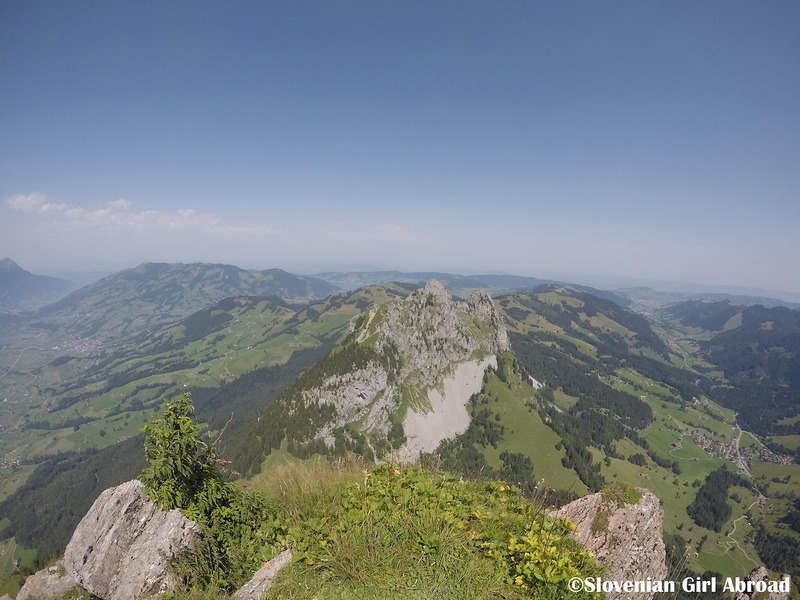 Our destination was 1.898 m high mountain Grosser Mythen located in canton Schwyz. We travelled from Lucerne to Schwyz by car. It took us app. 40 minutes to reach lower station of Rotenflue gondola station (Rotenfluebahn) located in Rickenbach at the outskirts of the Schwyz. We’ve left our car at the parking space by the station and took a cable car up to Rotenflue (1571 m), a starting point for many hikes in the region. From Rotenflue we walked downhill to Holzegg (1405m) , where upper station of gondola connecting Hozegg with the village Brunni can be found. 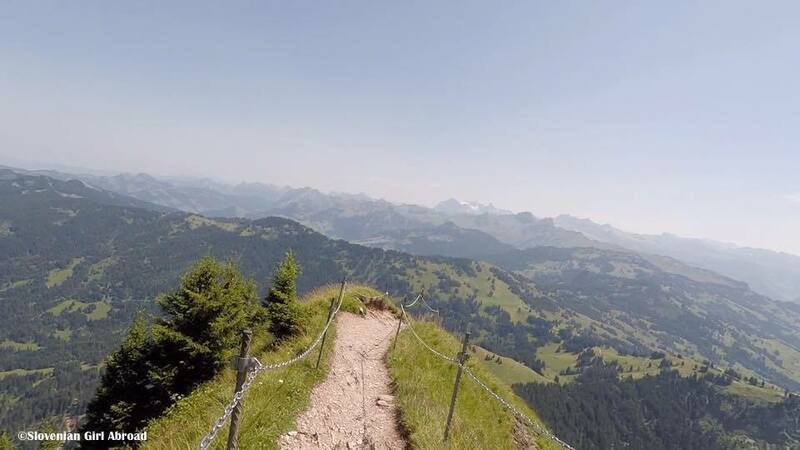 From there, the ascent to Grosser Mythen began. The ascent from Holzegg to Grosser Mythen wasn’t easy. The hiking trail, marked as T3 (“challenging”), is steep and narrow. In just 2,4 km it ascents from 1405 m to 1898 m altitude. To conquer it, the good level of fitness and good hiking shoes are highly recommended. I must admit, I was running short of breath on our way up to the Grosser Mythen, but I didn’t gave up. In about an hour and forty minutes, we’ve reached the top of the mountain. The exertion of the ascent was soon forgotten. 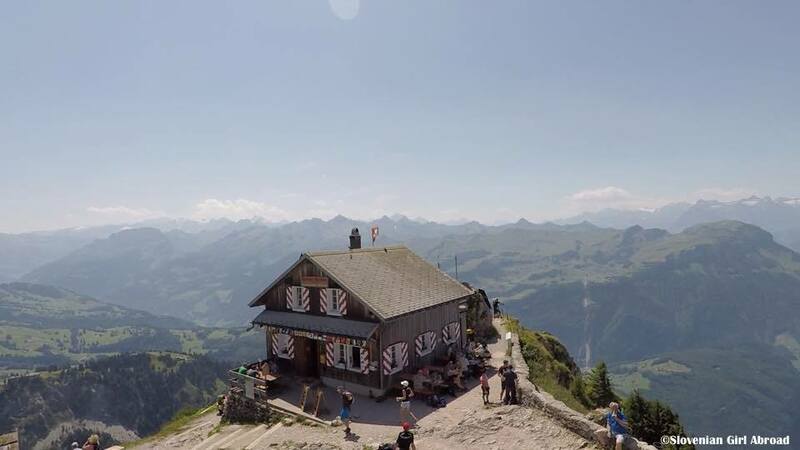 We’ve found our spot and rested our feet while enjoying lovely panoramic views of the Lake Lucerne (Vierwaldstättersee), Lake Lauerz (Lauerzersee), and the Alps. After some time resting and photographing the panoramic views, we returned back to Holzegg the same way we’ve arrived. The descent wasn’t easy either. The hiking trail is covered with rocks, some of which were quite slippery even on a dry sunny day. On the way up that wasn’t a problem, but on a way back down, I was very grateful for having hiking poles and wearing hiking boots. At Holzeg we’ve decided to rest a bit. At the restaurant of the Berggasthaus Holzegg we’ve treated ourselves with delicious Apple strudel with vanilla sauce. Then we’ve walked back way up to the Rotenflue where we’ve took the gondola back to the valley. We’ve reached Lucerne just in time before the summer storm hit the town. 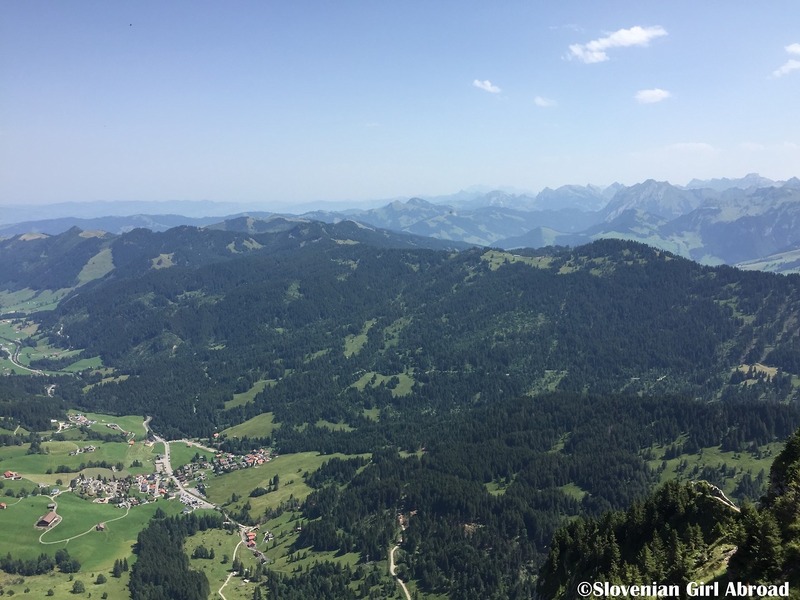 HOW TO GET TO GROSSER MYTHEN? At the highway A4 take the exit Seewen/Schwyz. Follow the signs and drive to the valley station of Rotenfluebahn in Rickenbach. Arriving from Zürich: At the highway A3 take the exit Einsiedeln. From there drive to Brunni-Alpthal. Thanks for sharing! I did that hike few years ago and I agree with all what you say. I recommend to get up very early (we started around 4 am) to watch the sunrise from the the top. And it is much safer to hike up there if only few are on the hiking trail. It sounds like you really earned that strudel :). Lovely to see the video with the splendid views from the top! 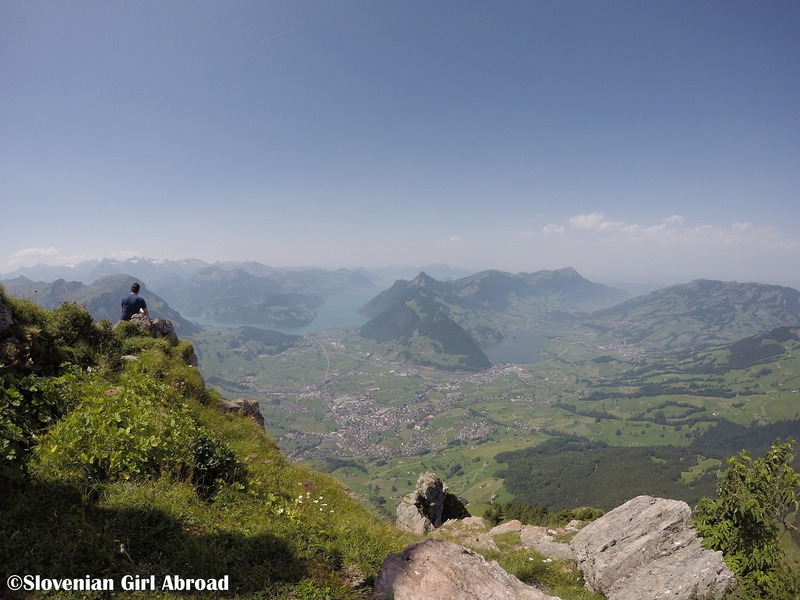 Beautiful photos of an exhilarating hike! on top of the world! Looks amazing! 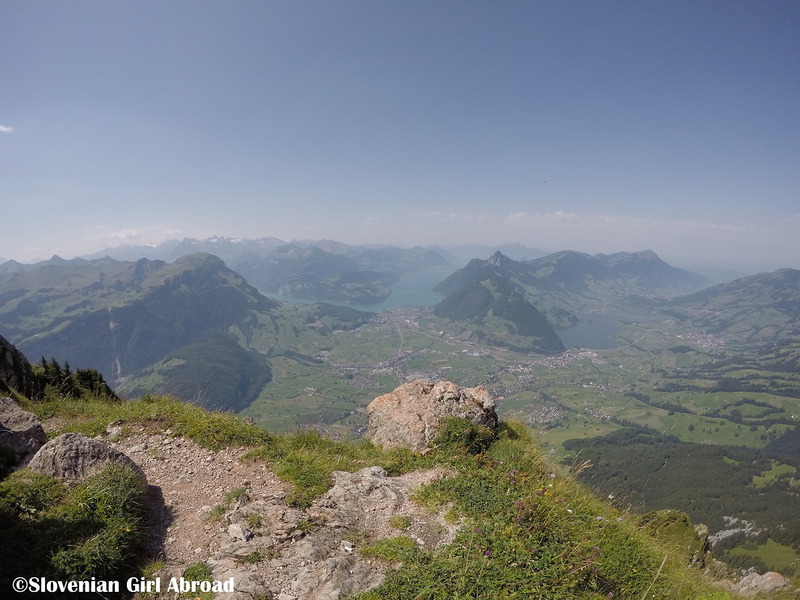 I love seeing your Swiss hiking adventures. The scenery is simply stunning. What a great way to spend Swiss National Day. Great video too. Thanks for joining us on #adventurecalling I hope you can again tomorrow. Proper equipment like poles and boots are so vital when hiking in the mountains!! I realized it quite late I have to admit, but now I would never go on a hike without my hiking boots ever again! A bit demanding, but very beautiful, yes. Thank you Erin! Glad you like it. 🙂 I think some of the parts of the trail might be a bit scary for those afraid of heights, but those sections are all well secured. It is worth conquering the fears to get to the top. The views are great! I am always drawn to try! !